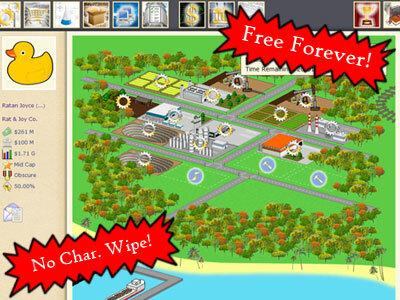 Economies of Scale is a free real-time browser-based text-based with graphics MMO business-simulation game with a tick-based store system. Sounds complicated? No, never complicated enough, because this game is inspired by the famous Capitalism Plus, which is among the most complicated and rewarding computer games ever made. The ultimate goal of Economies of Scale is to provide a deep, engaging, persistent world that encourages freedom and social mobility, and treats all players equally without regards to in-game age, real life cash, and real life spare time. In Economies of Scale, you are able to operate multiple companies, each of which can have dozens of factories, stores, and R&D buildings. Each building is able to produce, sell, or research a vast array of products at different qualities. Want to make a car? Simple. Just run a few mines for the coal and iron, a smelter for the steel, a plantation for rubber, a chemical plant for plastic, then auto factories for the vehicle bodies, engines, wheels, and the car itself. Oh wait, I think I left out the branch involving integrated circuits and microprocessors. Of course, this leads to player interaction, as you can trade any product over the B2B, or even import various finished goods from foreign countries. Being a factory owner isn't your thing? Maybe you can try running a store instead, all you have to do is to make sure you have the products in your warehouse, and put a price on them. Of course, if you want to achieve the maximum profits, then you'll have to play around with the simple equation of profit = (price - cost) * sold, and do it for all 114 products in the case of a supermarket. Need cash? Take a loan or go public. Don't want to do the work alone? Hire a competent CEO! Don't want to do ANY work at all? Invest in the stock market!